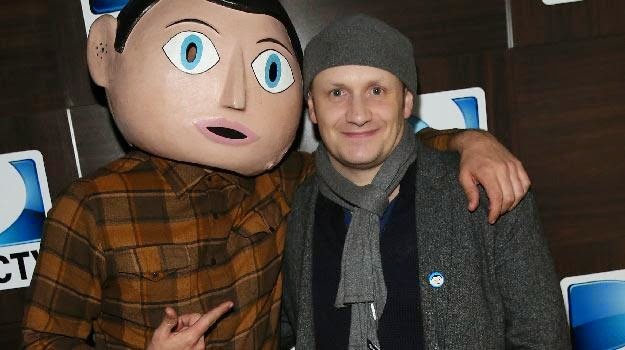 Although the large head worn by Michael Fassbender in Frank will look familiar to many viewers in the UK, Lenny Abrahamson's new film is far from the portrait of Frank Sidebottom that those viewers might expect it to be. Chris Sievey's comic creation was a perpetually upbeat northern pop star who emerged as one of the most bizarre success stories of the 80s and 90s, but the Frank we meet in this film is a resolutely uncommercial American musician viewed as a visionary by the rest of his bandmates. Instead of taking us back in time, screenwriters Jon Ronson and Peter Straughan have brought Frank bang up to date, using him as the inspiration for a very 21st-century tale of fame, artistry and confused ambition. With his fourth feature, Irish filmmaker Abrahamson is moving into new and unusual territory, and I spoke to him about it ahead of the film's cinema release earlier this year. Before discussing Frank I wanted to quickly ask you about Adam & Paul. You recently attended an event in Dublin to celebrate its 10th anniversary. How did it feel to look back at that film a decade down the road? The way things are, it came as a shock to me that it was 10 years. It feels much more recent to me. But I have very warm feelings towards that film and I have very good memories of making it. I suppose there are two strands to what I felt. One is that the film still feels relevant as things haven't changed all that much. I attended this very interesting discussion about 'where are Adam and Paul now?' with lots of people who work in that area, working with ex-drug users and current drug users, and the film still feels relevant to people in that world. And then with my own feelings on the film, it was just that experience of making a film where you had no expectations. It's your first film and nobody is looking over your shoulder, nobody is expecting all that much, and we had a very pure experience working with Mark and Tom. I also think a lot about Tom Murphy who died a number of years ago. He was such a great actor, and every time I think about that film I think about what a loss he is. There is actually a connection between Frank and Adam & Paul because I noticed that you’re working with the same cinematographer on both films. Yeah, James Mather. I think Frank and Adam & Paul do share a stylistic link, and therefore it felt appropriate that James was the DP on both. The central section particularly where they go off to record the album has a lot of freewheeling slapstick playfulness about it, and that echoed some parts of Adam & Paul. And I felt that both films share a similar tone, with the absurdist comedy giving way to something deeper and more soulful. That's true. Even though Frank is more overtly a comedy than Adam & Paul, it has its darker side or more poignant side, and that shape where you can play along with this really pleasurable surface and then find yourself looking down into something much deeper seems to be a feature of both films. In a way, it's been something I recognise in all of my films, it's there in Garage as well. You open with what looks like a very easily categorisable person, you think you know who he is and you don't expect him to reveal anything too deep, and then the film takes you to an unexpected place. It also happens in What Richard Did, you think this character is comfortably containable emotionally, and then you realise there's something deeper to be experienced there. So when Frank was first pitched to you, was that tonal shift the thing that hooked you into it? Actually, that tonal shift came later, it developed through the process of working with Jon and Peter. What hooked me initially was that freewheeling maverick playfulness at the centre of the film, that section was what really hooked me when I read it. The structure around it and the story was quite different, and then we started working together on it. As we developed the idea we realised that we could get at something with real emotional power through the telling of this story. When I first heard about this project I assumed – as I guess most people did – that it would be a film about Frank Sidebottom, but it has turned out to be something quite different. Was it like that at any stage, or was it always developed as a work of fiction? Before I got involved it had already moved away from a biopic of Frank Sidebottom or a biopic of Chris Sievey and Frank Sidebottom. Jon and Peter had already decided that they didn't want to go that way. So the Frank that I encountered when I first got involved was already American, and was more Johnston and Beefheart than he was Sievey and Sidebottom. Taking it in this direction allows you to ask some fundamental questions about the nature of art, and the film draws a line between people who see success as exposure and people who see it as the act of creating something. That's right, and while the film is very comedic it gave us a very vivid world that allowed us to talk about these things. The idea of picking a quintessential outsider seemed like the best way to explore those ideas. We're looking at a person and we just know that they're never going to function in the mainstream, but there is something so clear and beautiful in what they're doing, and that allows you to explore the tensions between creativity and success, and to ask what actually constitutes success. You've chosen to set the film today rather than in the 80s and 90s, and one of the running gags in the film is Jon's obsession with social media. Do you see people like Jon as a particular product of this era? We're all taught now that we have to be our own promoters and our own publicists, so people don't just make things they get out there and market it through social media. That's sold as an empowerment so that you take back your career from 'The Man', but on the other hand it takes your energy from the primary simple nature of making something and it turns you into your own marketing department. I don't necessarily think that's healthy, and in Jon's case he's somebody who confuses success with the numbers of hits and retweets and followers, so there's a kind of quantitative metric these days of what counts as success. Initially that was meant to be empowering and freeing because you could own that a little bit, you know, it wasn't just about being signed to a record deal, you could get out via social media and do it yourself. But at the same time, those numbers impose their own kind of tyranny. As an extension of this, your main character's Twitter and Tumblr accounts are both live in the real world. How involved are you in the marketing aspect of your films? Obviously with a film like this it might require a more unusual approach to selling it. Film4 have a really strong digital department, so with Anna Higgs and Hugh Garry we talked for a long time about how we could do it. The irony is that we're using those very tools to get the word out about Frank, but I think we're doing it with a certain kind of rich, ironic inflection as well. Given that Jon's tweets are the narration of the film, it was a lot of fun to create his account and actually it has been running for months. There's a really rich backstory there. That's what surprised me when I looked it up after watching the movie. There has been a lot of work put into that. And now it's actually going to get even richer, because Jon is kind of going to go on the journey of the film and you'll be able to see that reflected in his tweeting and blogging. In a nice way he'll be able to point you in the direction of some of the musical influences that went into our creation of the band, and his YouTube choices will become more relevant. So there's a nice bubble of interconnected content and material that adds to the experience of watching the film. I was hugely impressed with what Michael Fassbender does with the character of Frank, but what are the challenges involved in shooting an actor whose face you can't see? Well, there are loads of challenges. I watched a film not that long ago with a character who wore one of those Venetian masks, very flat and close to the face with no features, and I felt that was a very inert thing to put at the centre of the frame. But what's interesting about the Frank head that we had is because it's kind of cartoon-like in its expression you end up with this puppet-like figure in the middle of your scene. Rather than closing down the expressive possibilities it really adds to them and takes you into the territory you get with really great animation. The head is slightly different to Frank Sidebottom’s head. Did you spend a lot of time working on that look? The leap of faith I took was that if we designed the head right – and it is very similar to Frank Sidebottom's, but different in crucial respects – people would make an emotional connection to the character, and I think they have. People are very good at finding meaning in things, and in fact they impose meaning on things if they can't find it. You know the early experiments people did that showed how montage works? They would should a close-up of a person and cut to something warm and fuzzy like kids playing, you'd feel that the person was registering pleasure and all the things that go with an image like that. Then you'd cut the same close-up with something disturbing and feel that the person is registering distress. So we're very good at reading into images what the logic of the edit tells us to. Part of the challenge is how you construct the scene around Frank to help the audience really see something in that face, to help them believe that they're feeling an emotional response to it. With Michael you've got someone who is so physically articulate and so good at adding the smallest tilt of the head, or doing something with the rest of his body or his voice, to create an incredibly rich character. It allows us to play with things that are hidden too, so when you don't want them to know what Frank is thinking, you have that possibility and it works really well, either comedically or dramatically. The expressive possibilities come about in a different way but they're all still there. You make a joke of it in the film, with Frank telling Jon what expression he has on his face. Yeah, that was really funny to do, and that's some of the stuff that people really seem to go for when they watch the film. And there’s a good line where a character wonders what’s going on inside his head, and we wonder which head he’s referring to. Yeah, "I'd love to know what goes on inside that head." The funny thing as well is that when we were shooting, it was amazing how quickly we forgot that he was wearing the head. To answer your question in a slightly different way, I thought I would have to do an awful lot more work as a director to make scenes work with the actor's face hidden. What I discovered was, if you just trust the scene and you work with the actors to find subtle ways to use inflections of their body and voice, he's just there. The character just appears. You don't feel you're missing anything, he's no less expressive than any of the other characters in the film. It reminds me of a film I loved recently called It's Such a Beautiful Day. The design of that lead character is as basic as it gets, but he’s invested with so much emotion. That's a really good example. You can look at the most basic stick-man drawing, and it goes back to what I was saying earlier about how people are really god at finding meaning. With the most simple line drawings or even the most basic puppet – a glove puppet, for example – you can create massive emotional effects. Sometimes those effects can be strong in a different way to what you can get with a straight live-action drama. There's something about that simplification that brings out a core emotional meaning, and I think that's what you get with Frank. This is the kind of project that could work brilliantly or fall flat on its face. Was there any particular point in the making of it where you could feel that it was coming together and you'd made it work? There were lots of moments when I was very worried leading up to making the film. I decided to make the film and then I immediately thought, "God, this could be awful." I used to think, what if we're sitting in the edit a month after shooting the film and we look at each other and say, "Well, the head doesn't work." I mean, that really could have happened. One of the first scenes we shot with the head was the ashes-spreading scene in the desert, and when I first saw it loosely cut together by Nathan, our editor, I felt the tension draining away because there was something really lovely and delicate. It was strange in the right way – not just quirky in some kind of easy indie way – but delicate and expressive and human. I think the other thing was developing the music with Stephen Lennox. We had a week's rehearsal with the band before we shot and they really gelled, and I just felt that this music was impossible to categorise but it was clearly really good. Again, it's not a gimmick, there's something very unconventional but clearly authentic about it, and that was another point where I felt the film might work. The music has to walk a very fine line between being totally uncommercial but also showing some sign of creativity and talent. Exactly. Given that the dynamic of the film is Jon wanting to impose himself on the band to make them successful, you sort of have to be with Jon at various points in the film, you have to want them to succeed even if you ultimately learn that would be a disaster. It's no good if you immediately think, "Oh for God's, there's no way this band is ever going to be successful." There are parts in the film where the joke works because the music is completely barking, but for the most part you can, like Jon, imagine that it could work. Quite early on we decided that while the music was eccentric, experimental and unconventional, it needed to be good, and the reason that the band was never going to be commercial had as much to do with the members of the band. You just know that they could never handle that kind of exposure, or in Clara's case just didn't want it. If we had gone for a straight comedy where they make some kind of crazy noise music, then you don't really have anything other than a one-note gag. I wanted to ask you about your next project, but just before calling you I saw an announcment online that Brie Larson will be starring in your adaptation of Room. Yeah, it's amazing how news gets out. I was out and had my phone switched off, and then I turned it on and saw people talking on Twitter about it. But yeah, we have cast Brie Larson and we're really excited about it. So you still have to cast the child? Yeah, now that we've cast the mother the race is on to cast the child, and we've put aside a few months to do that so we're aiming to shoot the film in the autumn. Now the search for the boy begins and obviously we have other roles to cast as well, but we're heading for an autumn shoot. Each of the films you've made so far has been something quite different from the last. Is that important to you? To push against whatever it is you've made before? It seems to be. I make my choices in a very instinctive way, but I'm always drawn to something that I don't quite know how to do, and something I'm interested in exploring. You can't know it completely at the beginning or there's nowhere to go. With Room, apart from the technical challenge of working in a tiny space for a large chunk of the film and working with a child, it's another film that's tonally hard to get right. The book is told from the boy's point of view, so you have that really lovely voice to get between you and the harsh truth of events, and when you take that voice away it puts great pressure on the filmmaking. I find that a very scary and exciting challenge. But above all I find it very moving, and I think the ultimate thing for me is that the films I'm drawn to make are the ones that are very humane and possess a kind of unsentimental tenderness. That's what I found in Room when I read it and that's what really tied me into it.